Heroic greyhounds are not just a recent phenomenon. In this issue we would like to pause and recognize three greyhound heroes of the Eighties: Liddy, Mars, and Sword. Liddy, a female greyhound known as Flip Your Lid when she raced for the Currier Kennel on the Hinsdale/Belmont, New Hampshire circuit, retired at five years of age and was adopted by Lynne Perry of Yarmouthport, Massachusetts. The following letter from Ms. Perry appeared on the front page of the September, 1986 issue of New England Update, the newsletter of New England REGAP which later became GPA/Mass. “On a recent summer morning, at approximately 5:30, I was awakened by a loud crash in the basement of my condominium. Liddy, my REGAP adoptee, was on her blanket next to my bed. She woofed softly, as she does at any strange noise. I was quite sure that my cats were exploring the shelves and had knocked something over. I decided (foolishly), however, to investigate. “In the cellarway is a shelf, from which I selected — just in case — a hammer and Liddy’s brush, which has metal bristles on one side. I went downstairs, leaving Liddy at the top, still woofing and whimpering. She doesn’t like stairs and will go down only when urged. Through the open door to the basement guest room, I saw a pair of legs sprawled on the bed. The owner immediately sat up, and looking at my hand, said ‘Oh, my God — don’t shoot!’ (With a hairbrush???) I invited him to leave immediately, without taking into consideration that he would pass directly in front of me to the stairs, no doubt noticing — even in his drunken state — that the item in my hand was NOT a gun! That was when Liddy spied him, let out a most menacing growl, and with teeth bared, started slowly down the stairs. The intruder begged me to “call off my dog.” Summoning the utmost sternness, I said, ‘Liddy, HOLD!’ She stopped, but continued to growl as he went up the stairs and out the door. Leona and Arthur LaMotte had never seen either a greyhound or a dog track when they applied to adopt their first pet greyhound after reading an article in the Worcester Telegram. Mars, who raced for the Currier Kennel at the Raynham track as M’s Marsman, more than repaid them a few months later. During the night, while the family was asleep, the fringe from a blanket got caught in a heating element and began to smolder. Mars, sensing the danger, never ceased nudging Arthur until he woke him up and alerted him to the danger — thus preventing a fire which could have had disastrous results. Wonderland track, was adopted upon retirement by Joe Griffin of Fall River, Massachusetts. Sword became a hero when he grabbed Joe’s young nephew by the sleeve and held him until an adult could reach them thereby preventing the toddler from running out into the street where he could have been hit by a passing car. Over the years, these and other greyhounds have reacted instinctively when danger threatened their adopted family. 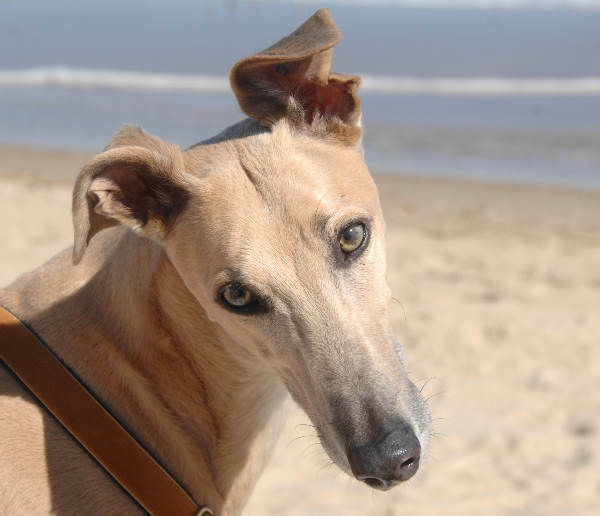 Do you know of a greyhound hero? Please give us the details. CG F 98 ALL RIGHTS RESERVED This article and any photos or artwork contained within may not be reproduced or reprinted without express written permission from the author, artists, and/or photographers.